When it comes to illuminating your interior spaces, consider adding an industrial lamp to give the room a modern, urban look. Whether you live in a traditional home or a sleek loft, industrial lighting adds functional light with an edgy slant that can be visually arresting or subtle and minimalist. Check out some of our favorite lights from the Dwell Store. When one thinks of a chandelier, often an elaborate, shimmery fixture comes to mind. 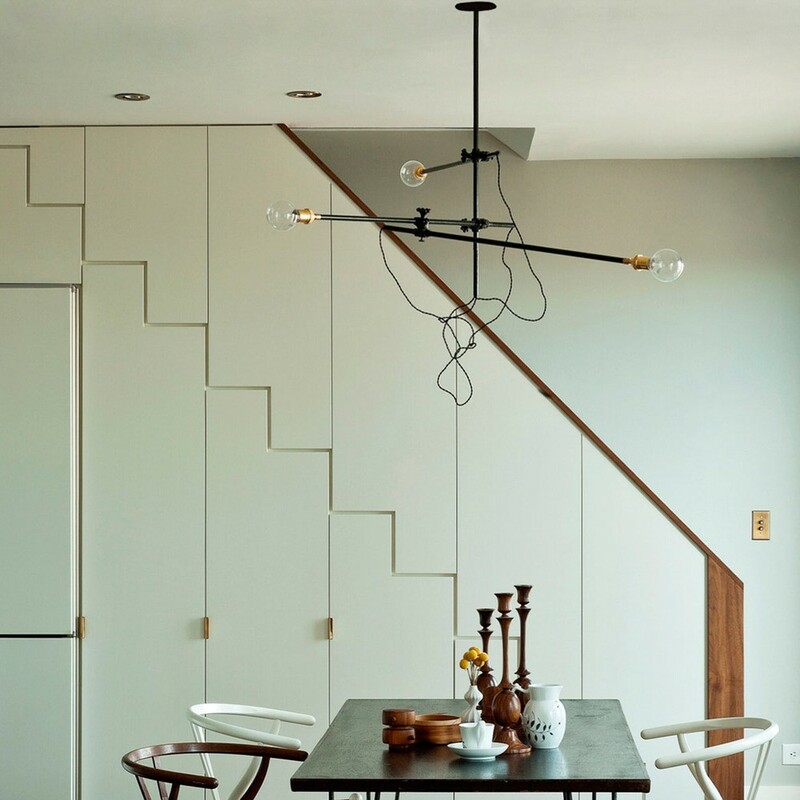 With its Industrial Chandelier, Workstead pares this idea down to capture the function of a chandelier—an overhead lighting fixture—with the simplicity of clean lines and a flexible design. The three-arm chandelier can be reconfigured into a variety of shapes, making it an adaptable piece for a many interior spaces. Structured as a horizontal fixture, the Industrial Chandelier can hang just three feet from the ceiling, or as a vertical piece, it can hang five feet for a more dramatic effect. Crafted from steel, repurposed industrial joints, and vintage Hubbell sockets, the lighting fixture has a mechanical, vintage aesthetic, while its minimalist design, exposed cords, and unshaded bulbs have an undeniably modern sensibility. From the Latin verb meaning, “to distinguish or resolve,” Cerno is an American industrial design and manufacturing company that specializes in innovative lighting fixtures, like the Macto Table Lamp. This distinctive lamp celebrates the natural beauty of walnut wood, as is exemplified in the solid wood base. The substantial nature of the base is contrasted with the verticality and thinness of the brushed aluminum arm. The arm can be moved to redirect light as needed, and the energy efficient LED lamp produces consistent warm light. When not illuminated, the Macto functions as a work of sculpture, giving the lamp an unexpected artful slant. The Axis Floor Lamp from Castor is at once a work of sculpture and a functional light source. Made of precisely machined and anodized aluminum, the light features three poles that intertwine to create a stable structure. The light source, within the main column, is able to rotate 180 degrees, making it easy to adjust light where needed. The other two rods can slide freely through the main column, which adjusts the angle of the light source. The sculptural floor lamp is an undeniable statement-maker, and can be used in a variety of spaces, from minimalist living rooms to industrial offices. The Wall Lamp is the simplest yet most adjustable of all of the fixtures in the Workstead line by Brooklyn-based design duo Stefanie Brechbuehler and Robert Highsmith. It can be utilized as a wall sconce, reading lamp, ceiling washer or even a task light. Shown here with a companion lamp, the Workstead Wall Lamp can be grouped with other wall lamps to create a versatile and graphic display. Complemented by a handsome black shade, the lamp is an elegant and flexible frame for a single bulb. The wall lamp is crafted from iron, steel, and brass in India. The Vertical Tube Light is an unexpected light that blends recycled materials and innovative design details to create a truly distinctive light source. The light is comprised of recycled T8 fluorescent bulbs as diffusers, which work to emit a soft, warm light. The recycled bulbs are secured by a powder-coated white metal strap, furthering the industrial look of the light. The light can be used to complement a modern interior, or as a pleasant contrast in a more traditional space. The Vertical Tube Light can be suspended on its own, or grouped in clusters with other lights to create a bold lighting display. Composed of two simple components, the Brick Lamp has an industrial look that will complement a rustic interior or provide a distinctive contrast to a sleek, modern room. In two different shades of black, the Brick Lamp is a neutral light with a sculptural slant. Designed by Philippe Malouin, the lamp is comprised of a perforated concrete brick and an aluminum cylinder outfitted with an LED array. The LED can be moved in a variety of places, making it an adjustable lamp for a desk, nightstand, or shelf. The Brick Lamp’s horizontal LED is balanced by the substantial, vertical brick, making the lamp a balanced light source. The Branch Double Floor Lamp is an industrial lighting source inspired by nature. Designed like a tree, the lamp’s base is elevated in a tripod design, resembling exposed roots. The column—or trunk—of the lamp yields two branches, comprised of perforated metal shells atop diffuser lenses. The varied finishes and exposed hardware of the fixture provide an industrial take on the lamp’s natural inspiration. The Branch Double Floor lamp works best when placed in an office or den, to give an elevated light source that is both modern and organic in construction.